Aspen House-Privacy, wildlife, adjoining National Forest, 15 min to Yellowstone! 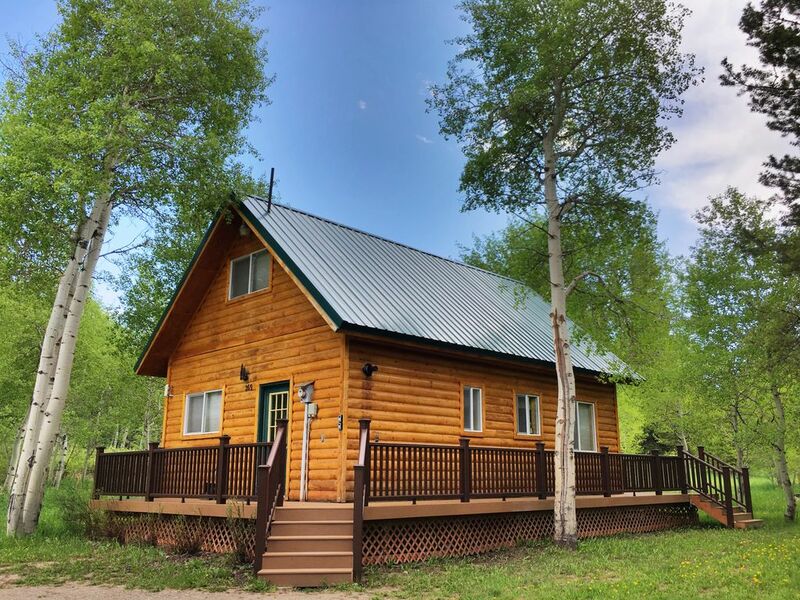 The Aspen House Cabin is in a beautiful and quiet rural neighborhood surrounded by National Forest, but only minutes from the entrance to Yellowstone Park and the town of West Yellowstone. It has amazing views of the nearby mountains, and is in an area that is regularly frequented by Yellowstone wildlife. This is a smaller log cabin with one main floor bedroom and a loft master bedroom. The cabin is surrounded by a beautiful forest of mature aspen and fir trees. It is well equipped, with a very cozy and comfortable feel. It includes all of the comforts of home, including a full kitchen, large screen TV, wireless internet, a barbeque grill, and a large yard. The cabin is furnished with great mattresses! It has Keetsa eco-friendly king-sized matresses in both bedrooms. It is also well appointed for fishing folk, with wader hooks and a rod rack for fishing rods just inside the entry door. Like hot showers but don't like to rush them? This cabin also has an instant-on continuous hot water heating system, so take your time! The cabin offers spectacular mountain views with easy access to Hebgen Lake and the mountains of Gallatin National Forest. It is accessible by driving on a paved highway from the town of West Yellowstone and then taking a short 1/2 mile drive down a graded, maintained dirt road. It sits in a secluded area at the base of the mountains forming the Continental Divide, only 7.5 miles outside the town of West Yellowstone and the western entrance of Yellowstone National Park. It is located in a small, quiet subdivision that is surrounded by Forest Service land. The Madison Arm of Hebgen lake, with a boat ramp, beaches, and swimming, is less than 4 miles away. All of the Park's animals also live and travel through the area, so it is not uncommon (depending on time of year) to see elk, moose, bear, fox, wolves, eagles and many other animals nearby. Hiking trails and groomed Forest Service snowmobile trails are accessible from the boundary of the subdivision, and snowmobiles can be ridden from the home in the winter. Cross country and backcountry skiing opportunities are also available right outside the door. It is in a great location for staging any Yellowstone adventure, whether exploring the Park or the surrounding forests and lakes while skiing, hiking, snowmobiling, fishing, hunting, biking, boating... Almost any kind of outdoor adventure, you'll find it here. There's plenty to do in West Yellowstone too, for those not as outdoor inclined. You’ll love it! There is a landline phone in the home for local calls. Great heat! For those wondering about AC - Our mountain climate doesn't require it, and homes in this area are not built with AC - call for more info! There is a landline phone in the home for local calls. WiFi available. However, internet and cellular services are limited here, no matter who the provider or where the location, in town or out. We have frequent outages, poor/slow performance, and many areas where cellular does not work, or works poorly, depending on your provider. Don't plan on doing business via internet or telephone while you're here! It cannot be counted on, no matter who tells you otherwise. We do not provide refunds or discounts for internet or cellular connectivity problems that are beyond our control, but we will do everything we can to help you maximize your uptime! Perfect home base for exploring West Yellowstone in Winter. Aspen house is a wonderful spot to enjoy west yellowstone in winter. The house has everything a couple or small group would need and the location (in a small aspen valley outside of town) is superb. Located near the base of lion head mountain we were pleasantly surprised to learn the house sits 500 yards from world class snowmobile trails leading to two top mountain and lions head. Yellowstone and the surrounding area in winter is amazing and Aspen House was a great home base. Perfect cabin for a winter escape! Very quiet, surrounded by trees, close to town. Totally awesome! Will be back 100%! We have stayed here before, so knew what to expect. The cabin was clean, well equipped, and cozy. No problems with winter access and close enough to town for skiing at the Rendezvous Trail system several time. Will consider another stay when the time comes. Thanks! Thank you for the nice star rating! I hope you didn't expect a fireplace or hot tub, as we don't have either listed as an amenity. We do however have other properties with one or the other or both. If you ever come back to West Yellowstone let us know. It was so lovely to come home to this adorable cabin in the Aspens after a day of exploring Yellowstone. It is so cozy and comfy. We loved the cabin. Set back at the end of the road with all the trees surrounding it. Beds were very comfy and the cabin had everything you needed. Washer and dryer was a plus. Weather was perfect not needing A/C or heat. Would definitely consider this cabin again. The area offers easy access to Yellowstone Park and the thousands of acres of surrounding Forest service lands. Accessible less than 0.15 mi/.25km from the home, the Gallatin National Forest offers abundant wildlife and hundreds of miles of hiking, biking, snowmobiling, skiing, hunting, and exploring. With spectacular mountain lakes and rivers that create a myriad of fishing and boating opportunities, there's something for every outdoor enthusiast. The town of West Yellowstone (7 mi/12km) has its own charms, with both summer and wintertime activities, live theater and movie theaters, dining, shopping, outdoor and wildlife educational programs, the Rendezvous ski/bike trails, and a museum. No smoking, no pets. Check-in 4:00 PM, Check-out 10:00 AM. Please download and read the Rental Agreement for our refund/cancellation policy and other details, or contact us for for a copy, or see a synopsis of the agreement here: www.westyellowstonerentals.com/reservations If you wish to avoid purchasing damage protection, you may make your payment through our company. We will hold your credit card number on file as a security deposit, but we will not charge the card until we have contacted you. We have other VRBO and HomeAway listings - Call or email and we'll get you what you need!